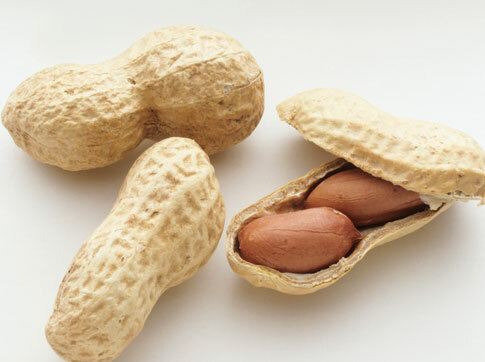 Peanuts, popularly known as groundnuts, monkey nuts, pig nuts, etc belong to the Fabaceae (bean) family. Peanuts, Arachis hypogaea is a legume species, and native to South America, Mexico and Central America. An annual herbaceous plant, that grows almost to ground level, with very slender stems, leaves that are opposite and pinnate with four leaflets, flowers that are pea-shaped, and fruits (legumes) that are basically seeds that sprout and mature underground. Presently, its cultivated world over in climates that are favorable for its growth; long warm periods and plenty of rain. As the stalks grow, they start to droop to the ground. When the pods begin to form, they slowly force their way underground, ultimately maturing under the soil, forcing the farmer to dig the netted, tan colored pods up. It is possible that peanuts developed this growth habit as a method of protection from hot tropical sun, since they have thin pods. Once the peanut pods are harvested, the plant is removed, and typically used for animal fodder. Despite their name, peanuts are not actually nuts, they are legumes. In most culinary uses, peanuts are classified as nuts because they behave more like nuts in the kitchen than other legumes, such as lentils and beans. For people with nut allergies, the distinction is particularly important, since many individuals with nut allergies can eat peanuts safely. Conversely, people who are allergic to peanuts can often eat nuts. In many parts of Africa, peanuts are more commonly known as groundnuts, a reference to the underground location favored by the pods. Peanuts play a vital nutritional role in many parts of Africa, since they are high in protein and healthy fats. In some parts of Africa, peanuts represent a substantial percentage of the protein available for consumption. In the American South, peanuts are called “goobers,” a variant of a Kikongo word, nguba. There are several important roles for peanuts in many areas of the world. A large percentage of the annual peanut harvest is pressed to yield peanut oil, a pale yellow, neutrally flavored oil with a very high smoking point. Peanut oil is ideal for frying, and is widely used in many countries for this purpose. The nuts are also ground into peanut butter, a creamy spread which is popular with people of all ages. Peanuts can be found for sale whole as well, to be eaten plain, sprinkled onto food, or included in various dishes. Have plenty of peanuts, for they are a rich source of vital nutrients, see yourself, as you scroll down to check some peanuts health benefits. Following is a peanut nutritional value table, that could vary depending upon the way and form (salted, plain, roasted, butter, etc) it is consumed. Nevertheless, what does not change is the many health benefits of peanuts. The table is for one ounce of shelled peanuts, equivalent to 28g. The shell or pod of the peanuts contains two, rarely three kernels in individual case like pods. The nuts are egg shaped, and the size depends upon the type of cultivar. Although each peanut is small in size, do not get fooled by its appearance, as you read further down, you will see why. Heart Healthy Fats: Peanuts contain monounsaturated and polyunsaturated fats that keep the heart healthy. A good level, of both; monounsaturated and polyunsaturated fats results in lowering blood cholesterol levels, and thereby reducing the risk of coronary heart diseases. Proteins: Protein is essential to the health of our cells. The cells in our body are constantly being replaced and repaired. To ensue that the new cells are healthy, and the damaged ones are repaired well, we need protein. Peanuts are an extremely high source of plant protein. It should be regularly incorporated in diet for children, vegetarians and protein deficient people. Antioxidants: Peanuts contain high concentrations of the antioxidant polyphenols, primarily a compound called p-coumaric acid and oleic acid, that not only protect the heart but inhibit the growth of free radicals, keeping infection at bay. Minerals: A rich source of minerals like magnesium, phosphorus, potassium, zinc, calcium, sodium, etc, so needed by our body to function well, is ensured by a regular consumption of peanuts. Adequate supply of these minerals ensure a healthy heart, and ensure minimized risk of mineral deficient diseases. Vitamins: Vitamins are important for overall growth and development. Vitamins ensure vital health for cells and tissues, and for fighting infections, etc, that in return ensure smooth functioning of our organs. Peanuts provide our body with essential vitamins, that also help in regulating metabolism, converting fat and carbohydrates into energy, and facilitating bone and tissue formation. A good source of folate, peanuts reduce the incidence of birth defects, and anemia related conditions. The number of peanuts health benefits match the number of ways it can be consumed; shelled nuts can be eaten fresh, roasted, or boiled, salted peanuts are often sold in packets or cans, the peanut oil extracted from this legume is used as a cooking medium, and broken peanut is used to make candy bars, and yes, let's not forget the creamy, crunchy peanut butter! Excessive peanuts intake may lead to gas, heartburn, and a suddenly developed food allergy to peanuts. A peanut allergy is perhaps the most serious food allergy you can develop. Peanut allergy sufferers are at high risk of serious allergic reactions that can actually be life threatening, even if the first episode of peanut sensitivity was not severe. If you suspect you have a peanut allergy, you need to get tested by an allergist immediately and avoid all nut products until the allergy is determined as legitimate or not. Most people who have peanut allergies will experience a reaction within minutes of touching or eating a peanut or a product that is made from peanuts. The reaction typically starts with a tingling sensation in the mouth followed by swelling of the face, throat and mouth. It can result in difficulty breathing, an asthma attack, anaphylactic shock and death. Less severe reactions include rash, hives and upset stomach. If you have a peanut allergy, you will want to carry an Epinephrine pen to counter any episodes while waiting for emergency assistance. If you have a peanut allergy, there is a good chance you also have a nut allergy that extends to all nuts. You will want to avoid all nut products, including pressed nut oils and any products processed on the same equipment as nuts. This allergy is so severe that even a tiny amount of peanut product can trigger a serious allergic reaction. Some people outgrow peanut allergies, but most do not. If you were diagnosed with a peanut allergy as an infant, you have a better chance of outgrowing the allergy than if you developed the allergy after age three. Most children and adults with peanut allergies have the allergy for life. This allergy is becoming increasingly common and has become the subject of much research due to the serious nature of the condition. Peanuts are susceptible to contamination of aflatoxin produced by a fungus, aspergillus flavus, which is very toxic and carcinogenic (causing malignant new growths that are found in skin or the lining of body organs), especially a risk factor to liver carcinoma. Once the peanut reveals a greenish yellow appearance, it is dangerous and can no longer be consumed. Also, those who suffer from stagnancy of dampness-cold and lingering diarrhea should not eat it. Alpha-linolenic acid is a fatty acid found in many foods. Most, but not all, studies have found that high dietary or blood levels of alpha-linolenic acid correlate with an increased risk of prostate cancer. Concentrations of alpha-linolenic acid are high in peanuts and other nuts such as almonds, Brazil nuts, cashews, flaxseed, hazelnuts, macadamia nuts, pecans, pine nuts, pistachios, and walnuts.